This seed bug was found beneath a rock in the Phoenix Mountains Preserve, Maricopa Co., Arizona. Dec. 2008. Thanks go to v. belov who made identification possible. 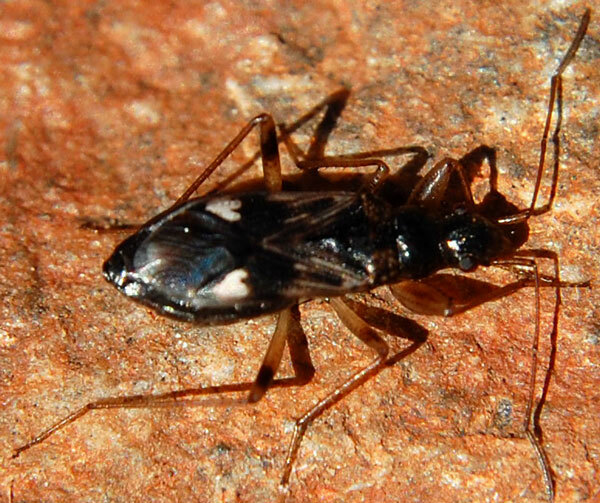 Seed bugs as their name implies feed mostly on seeds. The Rhyparochromidae are largely terrestrial, foraging especially on the soil surface and often beneath rocks or leaf litter. Here they use their piercing-sucking mouthparts to penetrate the seed coat to get at the nutritious contents within. The first pair of legs have an enlarged segment, the femur, which is distinctive and may assist in providing leverage for drilling into hard seeds. The biology for many species is poorly known - some may also be predaceous, others may be fungivores. There is plenty of opportunity for naturalists to fill in the knowledge gaps.